Rectory Farm Levisham is committed to ensure an appropriate accommodation service for prospective guests with disabilities. Due to the layout of the building, we do lack facilities for guests with severe mobility limitations but we do offer alternatives in our service to make Rectory Farm as accessible as we can. We welcome any enquiries from guests with disabilities so we can discuss their needs and all reasonable attempts will be made to meet these. Enquiries using email are available as an alternative for the hearing impaired. The fire alarms are audible only. The nearest train station is 12 miles away in Malton town centre. There is a steam railway service between Levisham, Pickering and Whitby, timetables are available. There is a local bus service on the A169 running between Pickering and Whitby, with prior notice transport is available. Taxi firms are available from Pickering. Pickering is a small market town with a full range of shops for a shopping experience. these include a chemist, small super market, several banks with ATMs as well as other shops. There is a petrol station with a small Spar supermarket selling limited supplies of essentials on the A169 about 6 miles away in the direction of Malton. Taxis can be booked for guests but guests are advised that there will be a minimum charge as the nearest is 7 miles away. All rooms have remote control. The digital TV in the guest lounge also incorporates radio reception. All rooms have hot beverage facilities with a variety of teas, coffee & herbal infusion available. We also offer fresh milk. Mobile phone coverage is average for most networks except 3 which is poor. There is a phone box outside the village hall. Mobile phone reception can be enhanced by walking up the lane past the village pub, and in some circumstances standing on the benches or tables in front of the pub. All areas of Rectory Farm and gardens are non smoking. We recommend people with limited mobility do not stay at the Rectory Farm alone. Rectory Farm has parking spaces for up to six (6) vehicles. There is no designated disabled parking bay. We have additional parking space for horse boxes and trailers. Rectory Farm entrance has a small step up from the car park area. The entrance is into a stone flagged hallway and then on to the carpeted hallway which leads to the dining room, guest lounge and other guest areas. This is all on the same level. There are two chairs and a small table outside the front door for the late evening sun. The hallway is lit with natural light as well as with electric low energy lighting. Rectory Farm has no ground floor bedrooms. The car park situated at the bottom of our yard, a gravel area for approximately five/six cars with additional parking underneath the three bay Dutch barn. The cottages are accessed by a doorway from the drive walking over a flagged footpath. There is a small lintel step and a step out of the footwell in both cottages. There is a small step into the kitchen and a carpeted staircase leading to the bedrooms on the first floor. This access would be inappropriate for anyone with severe mobility issues. There are two bedrooms in each cottage. One double, one single. One double, one twin. Bath with separate showers over. There are two tables in the dining room. Both seat four people whilst a larger extendable table can seat up to eight guests. All furniture is moveable. The dining room is carpeted and the guest lounge has scattered carpeting over solid oak flooring. Rectory Farm does not have a lift. The staircase in the main house has a single banister rail. Guest bedrooms have either a superking, double bed, twin beds or single beds. We provide bedding/pillow protectors and pillows are mixed type of hypo allergenic and feather pillows. We use synthetic duvets inside cotton covers. One bedroom has a tiled flooring system with underfloor heating. In the guest house the remaining bedrooms have carpeted bathrooms. In the holiday cottages the flooring is lino. 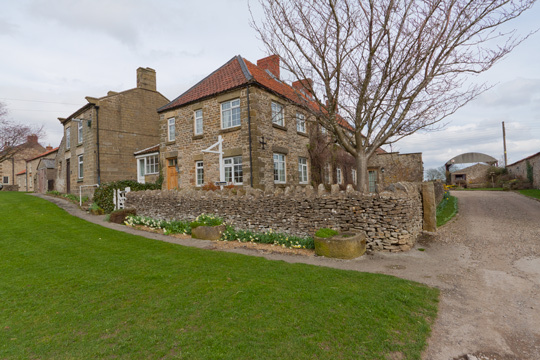 We do hope all our guests have a comfortable stay with us at Rectory Farm. With this in mind we do ask people, before they book, to discuss any issues with us, whether it is about access, special dietary requirements or anything else they may be concerned about.